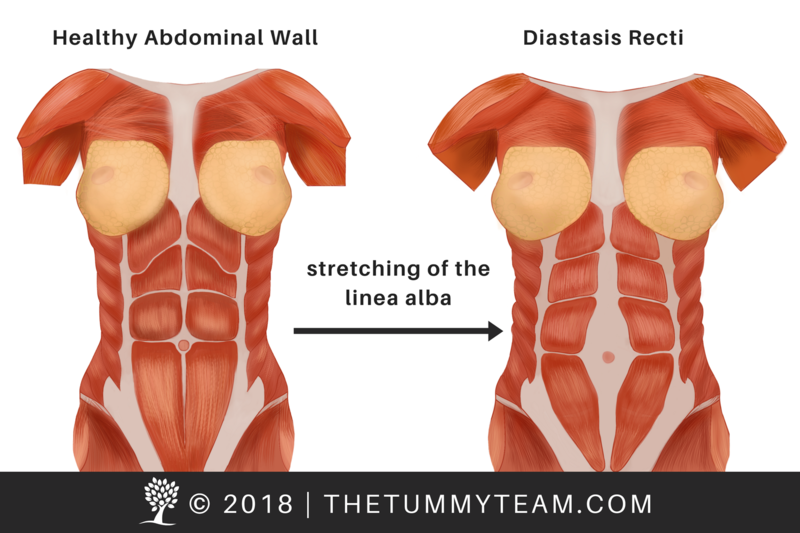 While Diastasis Recti is a diagnosis, it is also a symptom of a much larger issue known as Functional Core Weakness. It is possible to suffer from functional core weakness without having diastasis recti. But you cannot have diastasis recti without having functional core weakness. It is important to understand the impact of both of these conditions on your body. You have a group of core muscles that are primarily responsible for holding you up. The main muscle in this group, the transverse abdominis, is beneath your other abdominal muscles. It is the only muscle that wraps completely around the body to have a front, back, right and left aspect all in one. It is essentially a natural corset designed to elongate the torso and balance the entire body by securely connecting the upper and lower body. When this muscle is strong and active, it is your largest postural muscle, holding your organs up and in, and provides stability for your spine. 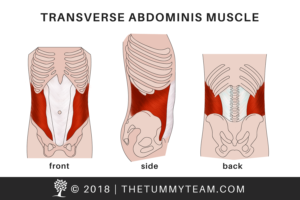 When the transverse abdominis muscle is stretched out, deflated, and inactive, your body collapses, your abdominal wall can bulge and your body functions on less effective compensation patterns. Without the pressure this muscle provides against your organs when active, your intestinal tract becomes sluggish leading to constipation, acid reflux, and even menstruation issues. Without the stability this muscle is intended to provide the spine, you suffer from SI joint instability, pubic bone pain, chronic back pain, and more. Over time, this lack of connectedness, strength, or stability forces your body to recruit other muscles to function. We call these compensation patterns. 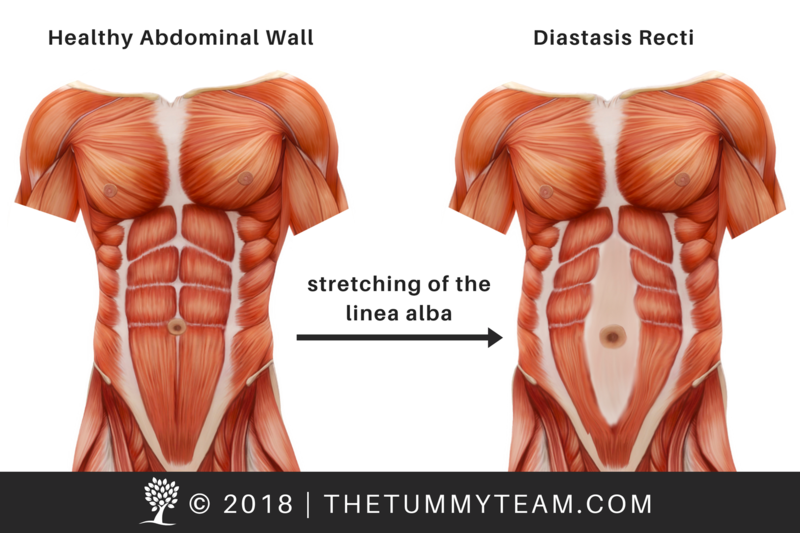 Diastasis Recti is a midline separation of the right and left sides of the abdominal wall. It can happen to men and women, regardless of age, weight or fitness level. It is caused by the most common compensation pattern for Functional Core Weakness: consistent forward and forceful pressure against the abdominal wall. This pressure can be from chronic poor postures, traditional abdominal exercises like crunches, sit-ups or planks, chronic constipation, and habitual bracing or bearing down. Both Functional Core Weakness and Diastasis Recti are treated the same way. Unlike what most people are told, diastasis recti does not require surgery and can be corrected with functional core rehabilitation. You will be amazed at how rehabilitating your core will affect your entire body. Our Functional Core Rehabilitation will strengthen the core, minimize movements making it worse, reconnect you to your body, close the separation, flatten your belly, relieve back pain and other symptoms, as well as retrain your body mechanics, posture, and alignment for long-term success. Not sure which rehab program is best? Take this 1-minute questionnaire.